I coach people struggling with challenges that have left them lonely and isolated. I create a safe, non-judgmental place using the human-canine bond to rekindle the spirit through pawsitive change. Are you just going through the motions of daily living? Have you emotionally isolated yourself from others? Loneliness kills! Medical experts found lonely people are nearly twice as likely to die prematurely. Incidences of heart disease, limited mobility, anxiety, depression, even suicide have been linked to loneliness. Don’t mistake alone-ness with loneliness. One is satisfied in the current state. The other is sacrificing his health and well-being. Don’t let this be you! Real life experiences with dogs saved me from a life of despair. The human-canine bond is a catalyst for positive change. Dogs have helped wounded warriors, the elderly, or people who have suffered trauma. If you are facing a painful, stressful time in your life, you may be erecting walls that physically or emotionally remove you from relationships and activities that are necessary for your survival. Every step we take together will incorporate canine sensibilities that will free you from self-limiting ideas, decrease stress, build relationships, and find balance in your life. Dare to dream again! You need not own a dog to participate in this revolutionary process. Learning to leave the past to discover your present will ultimately secure and energize your future. Receive the encouragement, support, and nudges you need to achieve and sustain your goals. I believe in changing lives one dog at a time. I have a Bachelor’s degree in Education, but my expertise comes from decades of hands-on experience and training with and from my dogs. I am a certified action coach through Coaching Firm International and recently became an Affiliate Member of the Institute of Coaching, McLean Hospital, Harvard Medical School. 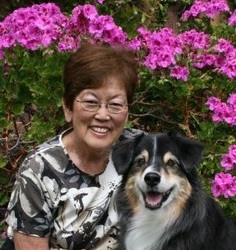 I am the author of several books in the canine genre as well as in the areas of self-help, motivation, and inspiration. Please contact me for a complimentary 30-minute introduction to explore how we can work together. Half the battle is won by taking advantage of opportunities we receive. Have you worked with Faith? Tell your friends! Since working with Faith McCune, I am becoming the person I'm supposed to be. Faith is an excellent business coach! Throughout our multiple sessions together she has been there to hold me accountable, encourage and help me see a different perspective on things when got discouraging. I would highly reccomend [sic] Faith to anyone needing motivation or accountability to start or grow their business. Faith McCune is the James Brown of Coaching. She is the hardest working Coach in the business but presents with such ease coupled with such intelligence and compassion. I was a hard nut to crack but Faith guided me to what I needed to know and do to move ahead successfully with my goals. Thank you Faith. I am very much in your debt. I am a therapist in private practice and recently had the opportunity to get coached by Faith McCune. I was having trouble making the best use of my time and needed to be much more productive with projects I needed to move forward. Faith helped my organize my time, and provided accountability that allowed me to get more done. Faith listened patiently to my challenges and understood clearly what I was trying to accomplish. She is a knowledgeable and experienced coach who understands the challenges of being a “solopreneaur [sic].” The most significant result I achieved from working with Faith is a greater understanding of how to balance my work and family life. I highly recommend Faith McCune to any business person desiring to have more balance and productivity in their life. Thanks to [coaching] principles, I transformed aimless goal setting to persistent and intellectual benchmarks. Faith McCune steadily coached me through unrivaled criteria, now an integral daily practice. Accomplishments and options once thought ‘too lofty’ are reality. I was overloaded and very stressed. I finally began to see my strengths and weaknesses. So, I started taking more time to surround myself with those that support, encourage and care for me. Decision making has become easier. I find I have more control of my life, more competence, caring, and creative expression. I’m more relaxed, alive and ready for what the world has to offer. I’ve achieved a new happiness. Faith has helped me to be proud of whom I am. Because of Faith and her belief in me I’ve received unlimited value from the sessions! In the beginning, I wasn’t happy because I didn’t have time and there were so many obstacles not allowing me to face and reach my personal goals. Procrastination and fear were methods of control that could have led to failure in my life journey. Instead, I’m on a new journey and it fills me with lots of happiness! I have new hope, success, achievement and possibilities available to me due to Faith’s encouragement and support. Sometimes in life we believe that things are going well until a good friend gives a different point of view. And if you're lucky that best friend understands how to coach you to see the truth and possibility of your life. And so it was as I began to engage in a coaching relationship with Faith McCune, she had that innate ability to see what's possible in my life and encourage me to become my absolute best and to live in unlimited possibility. I truly believe and I'm proud to say that she helped me to keep the faith of who I am. People closest to you may be in pain without you knowing it. Loneliness hurts. Suffering in silence isn't a solution, but a dog might be the answer.